Quick, simple & tasty. Tofu is good for health when compared to Paneer. Try this. Grind the Pudina, Coriander & Green chillies with a pinch of Salt to a smooth paste. 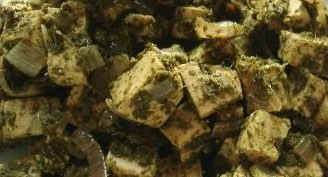 Add the Tofu pieces to this paste & mix well. Keep aside for 25-30 mins. Heat Oil in a pan. Add Cumin seeds. Fry for few secs. Add Onion & fry till translucent. Add Ginger-Garlic paste. Fry for 5-10 secs. Add the Tofu pieces and mix gently. Add Garam Masala powder & adjust the salt, mix well for a minute & remove from heat. Sprinkle some chaat Masala and lime juice. Serve with Roti, Chapati or Steamed Rice. Note: Can add little water to make it a gravy. This is a great recipe. Thanks, you must be one hellofa cook. Keep posting more recipes. I am a diehard nonveg, but do enjoy veg from time to time and family and friends do enjoy the veg dishes I make more than the nonveg! Wonderful Recipe . I just luv dis . Thank U .